Ryan Zimmerman looks to be in mid-season form. The Washington Nationals All-Star third baseman doubled, homered and scored twice to help pace the Nats to an 8-4 win over a split-squad St. Louis Cardinals team under beautiful skies in Viera, FL Monday afternoon. Zimmerman ended his day 2-for-3 and is hitting a robust .583 this spring. Jesus Flores also homered with two RBIs, Tyler Moore went 2-for-2 with a run and Corey Brown went 2-for-4 with two RBIs and started a double play at first after making a sprawling catch in medium left center field. HIs strong throw back to Adam LaRoche covering first nailed Cards catcher Yadier Molina by a couple of steps. Michael Morse made his return to the lineup after missing a few days with a wonky back. He drove in Zimmerman with a first inning double and ended his day 1-for-2 with a walk. Nats starter Jordan Zimmermann didn’t fare as well. He gave up four earned runs on seven hits and a walk. He did not strike out a batter and was generally knocked around a bit. In the first inning he gave up a solid line drive to center by Molina and a flared single to right by Matt Holliday before surrendering a wind-aided opposite field homer to World Series MVP David Freese. Matt Purke followed and went 1 2/3 innings, giving up a hit and a walk but no runs. He struck out Holliday swinging and earned the win. Chad Durbin struck out two in two innings, Henry Rodriguez did the same in one inning, and Sean Burnett closed things out in the ninth, allowing two hits but no runs with a strikeout. After the game, the Nationals sent Purke and Anthony Rendon to Single-A Potomac, 3B Carlos Rivero to AAA-Syracuse, and sent OFs Corey Brown and Xavier Paul, INF Jarrett Hoffpauir, C Sandy Leon and pitchers Rafael Martin and Austin Biebens-Dirkx to minor league camp. 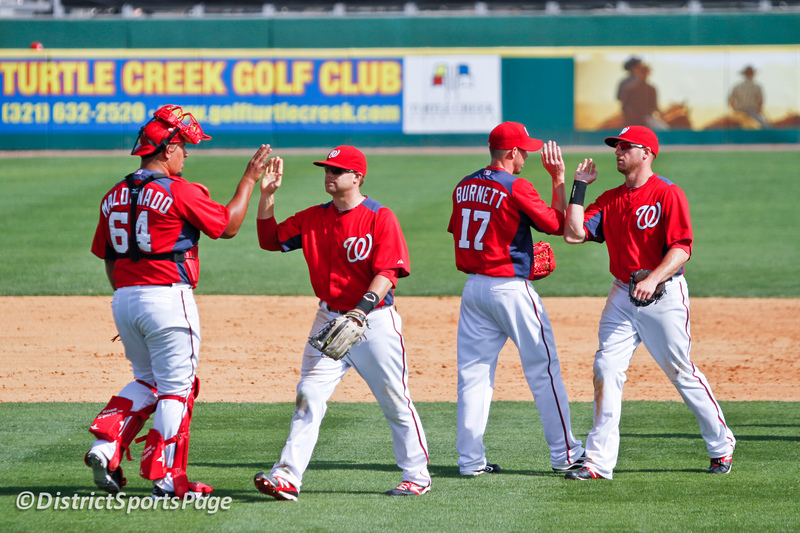 The Nats host the Detroit Tigers Tuesday at 6:00 pm. Edwin Jackson is scheduled to start and Ross Detwiler, Ryan Mattheus, Brad Lidge, Tyler Clippard and Ryan Perry are all scheduled to pitch, according to MLB.com.